With my daughter Juliet I was visiting the Andaman Islands where 100 years ago my grandfather Reginald Lowis had risen to Deputy Commissioner and Acting Commissioner in what was then an Indian penal colony. He had met and married Bessie Coldstream the young niece of the head of the British Military there George Anson and my mother and both her sisters and a brother had been born on Ross Island where the senior British administrators and military lived across the bay from the capital Port Blair. The visit was part of my researches for a book on my family’s role in India during the days of the Raj. My mother told me about an extraordinary childhood on the islands and I still had a series of articles written by her mother about life there. I was particularly interested in their stories of occasional contact with the aboriginal Andaman islanders who for centures had avoided all contact with outsiders and had even killed the survivors of shipwrecks with their tribal arrows. Yet mother’s memories were of the warmest embraces from negrito tribes people and my aunt remembered races with small Andaman children on the backs of turtles. From the start of British involvement in the islands, the tribes had all been particularly vulnerable to imported diseases such as measles, so often followed as I learned in Africa by deadly pneumonia, against which they had no immunity and their numbers had fallen steadily and in the case of some, dramatically. At that time nobody knew whence these tribes had come. Their appearance was clearly African and their stature suggested pygmy origins. Quite clearly there was no trace of the blood of races inhabiting neighbouring landmasses in their appearance. So how and when had they got to the islands? Though grandfather’s generation speculated on African origins there was no evidence. Now DNA from hair collected in the 1920s confirms the direct African link going back 40 – 60,000 years to the very oldest human beings who set off eastwards across what is now Arabia. In Grandfather’s day British policy was broadly to leave the tribes alone though relationships of a sort had been established with the Great Andamanese the so called friendly tribes inhabiting the main landmasses of Middle Andaman and North Andaman for trade in local products such as tortoise shell and trepang. There was no contact at all with the two so called unfriendly tribes, the Jarawa and the Onge. Living in the area bordering the convict settlement the Jarawa from earliest times had regularly killed convicts and their guards. Punitive expeditions had been organised but these were largely ineffective and as the tribesmen merely melted into the uniformly thick forest on the approach of soldiers or police. Meanwhile far sighted British policy to help convicts to fulfil themselves through the development of skills of all sorts and allowing them to marry female convicts helped develop the economy and the population grew. In WW2 the islands were occupied by the Japanese who though they executed many local settlers did not attempt to interfere with the tribes. After the war and Indian independence Indian ex-service personnel settled in the islands and there were settlers from places like Burma and Bangladesh. From less than 20,000 in grandfather’s day (including the military and convicts) the population has grown to about 150,000. Two thirds are Hindus and the rest divided evenly between Christians and Muslims. It is a diverse and vibrant population happy with its diversity and according to our faithful Muslim taxi driver proud to be Indian. We enjoyed the diversity and the friendliness and ourspotless modern hotel in Port Blair with superb views of the sea and of neighbouring islands. 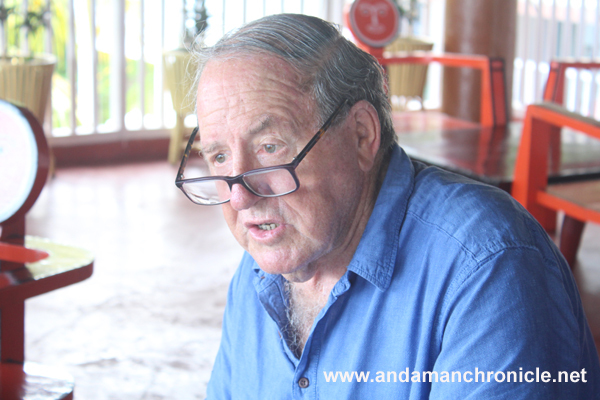 After four days of meetings including with the governor, a modern air-conditioned passenger catamaran took us on a two hour voyage to Havelock Island where for the last two days of our visit we had a taste of the real wild Andamans. Our hotel was set in virtually impenetrable forest with a path leading us 200 yards under the biggest trees I have ever seen down to a beach of coral sand famed worldwide for its beauty. What brings in the tourists? I got the impression that the government and local authorities would like the main attractions to be the sea, sand and local beauty combined with the island’s history of supposed suppression under the Raj? Sadly on Ross Island the old government house, the Anglian Church and the little hospital where mother was born were destroyed by the earthquake in 1941 and are unattractive ruins. Part of the Cellular Jail built first to accommodate mutineers after the Indian Mutiny after the establishment of the penal colony in 1858 has been well preserved. It was evidently a very tough place and in the early days 150 men with no hope of release escaped and all perished at the hands of the tribes. By the 1900 the convicts were of a different type, mostly murderers and others male and female convicted on the mainland of serious crimes , most of whom went on to build the new Andamans. Their descendants, many of whom we met, are justifiably proud of their ancestors. The main attraction for the tourists overwhelmingly mainland Indians, is the tribes. They have been given the chance of seeing tribes people thanks to the Andaman Trunk Road part of which runs through tribal territory. It was built in the 1990’s when several construction workers were killed by tribal arrows. The Indian Supreme court ordered its closure in 2002. However thanks no doubt to promises that the welfare of the tribes through whose territory the north south road passes would be top priority, the road remains open and daily up to a hundred or more, government buses filled with tourists leave Port Blair and race north to the border with tribal territory to lead the queue. There are many informed and influential Andamanese who see these journeys as offensive and humiliating for the tribes and liken them to wildlife safaris. Some international organisations don’t like them either. The authorities are understandably sensitive about what is happening. It tries to prevent malign influences through strict policing of the convoys by banning photography. The tribe affected is the erstwhile ‘unfriendly’ Jarawa some of whom are, according to a couple of tourists we met on Ross Island, to be seen on the road looking for handouts if not from passengers, from bus drivers. Such contact is leading to increased dependency and to possible extinction. Meanwhile the principal future pressures are likely to involve the so called settler community which wants more land, the tourist industry which is becoming aware of the Andamans for its world class tourist potential and the Andamanese aboriginals and those who speak up for them. Though the Indian Supreme order on the closure of the Andaman Trunk Road has not been complied with the government remains committed to protecting the tribes and is backed by local administrators and by influential settlers including members of the influential Locally Born Society who remain determined to be positive. This gives some hope for the future but is there sufficient awareness of what the tribes have always been aware of – the deadly danger of which my grandfather warned over a century ago, so called “civilization”? So, real determination will be needed to safeguard the tribal reserve areas from further outside incursions and contacts. Meanwhile it seems to me that the Indian government should try to put aside its understandable sensitivity over what it sees as outside interference and recognise legitimate deep worldwide interest in our earliest forebears and seek international cooperation in protecting them. We flew from Chennai to Port Blair over remote North Sentinel Island inhabited by untouched and still very hostile tribespeople. In my opinion it should be given immediate top level world heritage site status and all international help and support given to the Indian government to keep people away.